Marble thresholds are an excellent investment in any building project. More durable than wood, they withstand traffic better than metal and look more attractive than either material. It’s a very elegant addition that will make the home more visually appealing. StonExchange has five different options for natural stone thresholds or windowsills, and here are a few ways that you can use them in your next project. Travertine tiles are a popular choice in many building projects. They can be used in kitchens, bathrooms and throughout the living area. A durable stone material, they are also used for patios and pool decks. If you want a seamless transition, then choose travertine thresholds that will blend nicely with the flooring and make a smooth transition to the next area. However, the uses for travertine thresholds extend beyond matching other flooring materials. The natural beige and tan colors of travertine make it an excellent choice when you’re putting in a stone transition strip next to wood. If you have wood cabinetry with contrasting floors, then consider using travertine to keep the entire design scheme balanced and visually appealing. If travertine has been used in the shower stall of a bathroom, then you can install travertine as a threshold to the room to help tie everything together. You can also turn a transition strip on its side and install it along the stair risers for a durable finish that won’t become marked and scuffed by shoes. While standard size transition strips may not work for this application, we can have the proper dimensions custom manufactured in our overseas plant. Using this brighter color on stairwells can help people better gauge the height of the stairs, and it adds visual interest to what might otherwise be a bland space. This marble features the traditional white and gray finish that has been popular for centuries. Predominantly white in color, it has pale and deep gray veins that dance across the surface in an elegant pattern that only nature can create. Appropriate for use in any modern bathroom where you want a sophisticated look, it can also be used as the doorway thresholds throughout a commercial or hospitality project. With the gray coloring moving through the surface of this marble, it’s an excellent balance point to black granite and other deep colors. If your design plans call for a black and white checkered floor, then finish it off with a white marble threshold. A neutral color, it also looks fantastic against any shade of red or green marble. The slight movement of color makes it an ideal finishing touch against solid-colored carpets and tiles. It adds a little bit of interest and movement to a space that is otherwise ordinary and lifeless. Consider ordering single Hollywood beveled thresholds and use them as baseboards along the floor for a surface that’s easy to clean and will never need to be painted. 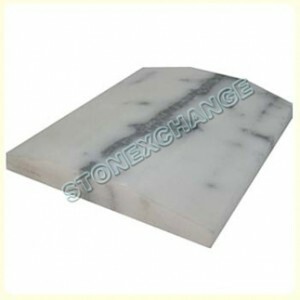 In addition to manufacturing marble thresholds, StonExchange also offers this material for window sills. It features a timeless look and finish that works with any number of decorating schemes or colors. This makes it an excellent choice for both residential and commercial projects were you want to impress your clients with your attention to detail and use of elegant materials. Thresholds see regular foot traffic and will inevitably get dirty. Even natural stone may become scratched over time just through normal use. If you want to ensure that your thresholds always look fantastic, then consider using black granite from StonExchange. Our granite thresholds feature a highly polished surface that reflects light and makes any room look more sophisticated. Doorways in any area may seem to be a little darker, so the black finish of this natural stone will blend seamlessly. Finally, the darker color will not show dirt and stains. Black is a surprisingly neutral color. An attractive finishing choice, it works with anything from light tan carpet and wood flooring to brightly colored ceramic tiles. In addition to using it in doorways throughout the construction project, it can also be used as a shower curb. We offer Hollywood beveled thresholds that are ideal for keeping the water contained to a space without being obtrusive. Double beveled thresholds are an excellent option for handicapped accessible spaces where you need a smooth finish for wheelchairs to maneuver. They’re also a good choice for people with limited mobility who would struggle to lift their feet up over a higher threshold. Creme marfil features a lovely tan shade that’s comparable to travertine. The coloring is more consistent with light mottling in darker shades of brown. This smooth shading makes it a good choice for doorways and window sills where you want to marble to visually fade into the background. Choose this finish when you’re installing luxurious marble tiles and want to keep the attention on the main room. While this stone makes an excellent transition, the thresholds can also be used as shelving inside shower stalls. Float a threshold across the narrow section of a shower stall to store toiletries and soap. Hang a shelf above the sink for bottles of perfume and cologne. In the kitchen, you can mount a threshold below a brightly lit window for growing your own herbs. The marble is highly durable and resistant to water, so it makes an excellent accent shelf in high moisture areas. This engineered stone is ideal for luxury suites and professional offices alike. They’re made using quality resin and molten glass. The result is a completely smooth finish with a brilliant white color that works with any decor and architectural style. The price on these stones is very competitive, so you can lower the expenses on your overall project and increase profit margins. The high polish finish on this material reflects light and makes areas look larger. It’s an excellent choice for making small thresholds or window sills look larger and more impressive. Installed on raised thresholds, it creates an attractive and durable finish that’s also highly visible. With a pure color and meticulous finish, Pure White Thazoz is an excellent choice for contemporary resorts and modern decorating themes. It balances beautifully with the darker colors and adds that highly polished finish you love. In addition to being used in thresholds, it can also be used as the backsplash along kitchen counters and as a threshold into pantries, closets and other areas. As a contractor, you appreciate the importance of paying close attention to detail. Your clients will notice the finishing touches, and you want them to be impressed with your dedication to excellence. Work with a supplier that can provide you with wholesale prices on high-quality merchandise. StonExchange offers these particular colors based on market demand. We have a range of stock sizes in our Miami warehouse that are available for immediate shipment. If you require custom sizes, we’re more than happy to accommodate you. There is a minimum order amount required, and we ask that you allow six to eight weeks for final delivery. All custom orders are manufactured and finished by the same overseas professionals who work on our standard stock items. Our customer service professionals are looking forward to helping you, so contact us today!